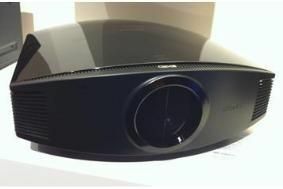 MANCHESTER SHOW 2010: Sony demos its first 3D projector | What Hi-Fi? JVC has three new 3D models and Sony has this, the VW90ES, which we first saw at the Berlin IFA Show in September. It's a Full HD, 1080p model with active shutter glasses, based on SXRD technology. It's an evolution of its top-rated 2D model from last year. Pricing has still to be finalised, but we understand it's likely to cost more than £5000. To find out more about all the clever technology packed into this cutting-edge projector, watch our video news report.